It's not always easy to keep your head warm at this time of year. Hats can be a bit bulky to fit under a helmet and can reduce its effectiveness. A Buff works, but can be a bit thin. 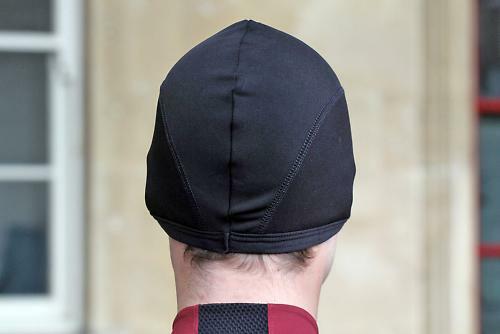 Enter the thermal skullcap: it's specifically designed to provide as much warmth as possible with as little bulk as possible and is a must-have for the year-round cyclist. This one's put together from five panels of four-way stretch half-and-half nylon and polyester mix with a brushed lining. It fits well, and the seams are kept away from any pressure points. It comes down to just below the ears. In use, it's easy to forget you're wearing it. Which is a good thing: no niggles with fit, and surprisingly warm for a non-windproof hat. And best of all, there's a penny change from a tenner. It's available in black or black, size small to extra large. Great winter layering piece for added warmth in cooler seasons. It fits well under a helmet, the seams are out of the way of any pressure points and keeps my head warm. The Lusso Thermal skull cap has kept my head remarkably toasty for a non-windproof skull cap. It's no-nonsense, inoffensive and works for less than a tenner. What's not to like? Can I ask what jersey the model is wearing? It looks quite attractive, from all 1cm of it visible.
" Hats can be a bit bulky to fit under a helmet and can reduce its effectiveness." The syntax suggests that the writer is saying that a hat can reduce the effectiveness of a helmet. What is the evidential basis for this assertion? I have one of these...highly recommended. I think he means that if the hat affects the fit of the helmet then it may not be in the right place on the head when an impact occurs. I have got a few of these - great bit of kit and I don't have to adjust my helmet and its British Made. I have just got one of the new Lusso Leggero Thermal Jacket and the fit is SUPERB !!! That is indeed what I meant. I haven't compared crashes with or without a bulky hat under a helmet in order to prove this assertion.